When you buy a house in the middle of winter, you take a lot of things on faith: the yard will look reasonably similar to the features of the snow; the buried section of roof will look somewhat like the portions visible under the eaves; and there will be some things you never expected. We closed on our new home in February, intrigued by what was lurking beneath the snow. 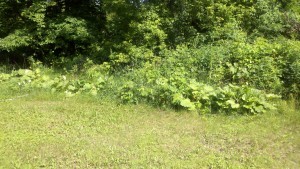 Little did we know there was a trophy-class rhubarb garden. With 14 plants in one section and a lone monster guarding the other side of the yard, there was more rhubarb than our family of four could eat. All that rhubarb called out to be used, but what could we do with it? In order to make rhubarb enjoyable, you must use so much sugar we were tiring of the sweetness. Plus, that much sugar adds to the waistline. Last year I purchased the Winemaker’s Recipe Handbook from my local homebrew supply shop. Armed with that recipe, some tips from Beverage Artisan and a whole mess of rhubarb, I set out to make some rhubarb wine. I merged the recipe from the book with some tips from Doug to develop my own homemade wine recipe. Never having made wine before, I have no idea how this will turn out, but the must smells awesome! I lined a 20-quart stainless steel pot with a straining bag. 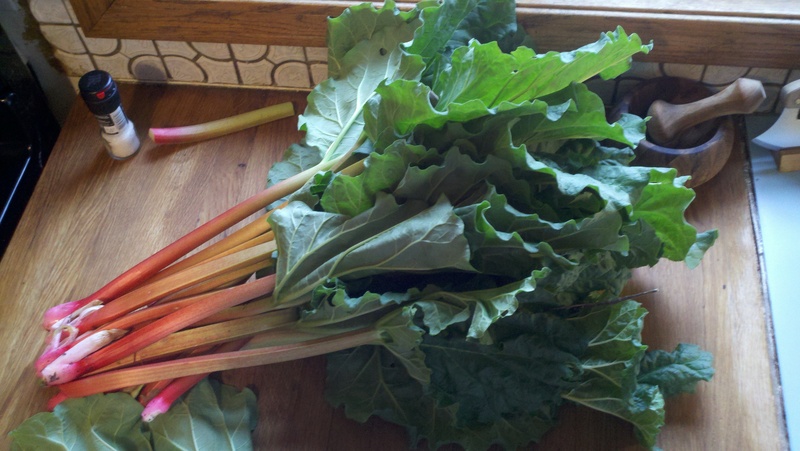 After chopping the rhubarb into approximately 1/2″ lengths, I realized he chunks were too large to allow all of the good flavors to make it into the water quickly. So I ran the rhubarb through the food processor with the steel blade attached, but stopped while there were decent-sized chunks. I added all of the ingredients except the water, Campden tablet, nutrient and yeast inside the bag and stirred with a stainless steel spoon. Holding back 2 cups of water, I added the remainder of the water to the kettle. I added the yeast nutrient to 2 cups of water and heated in the microwave until boiling. I crushed the Campden tablet and added to the hot water, stirring until all material from yeast nutrient and Campden tablet were dissolved. Placed lid on pot, with edge raised to allow off-gassing of Campden tablet. Wait 24 hours, then pitched 1 packet of Montrachet yeast proofed in 1 cup warm water. Stirred must to incorporate yeast and continue mixing ingredients. Stir daily for 1 week using a sanitized stainless steel spoon. Squeeze the strainer bag to extract as much flavor and liquid as possible. Transfer to glass carboy for extended primary fermentation. I am at this stage as I write this article. I will have to follow up in a few months once I see how it turns out. Rack as needed to clarify. I plan to try some other fruit wines when I have the fruit & the time. What do you think of rhubarb wine? Let me know in the comments below.